Clavamox for dogs and cats is a prescription broad spectrum antibiotic that treats a variety of infections caused by bacteria. 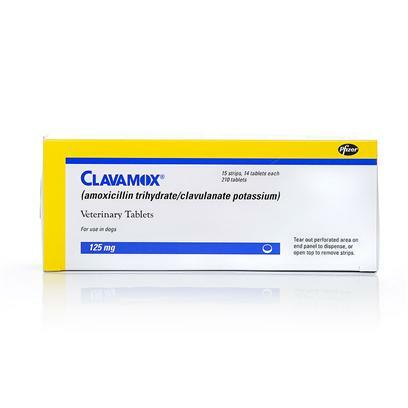 Clavamox is specially designed so the bacteria cannot build a resistance to it and it is used for skin and soft tissue infections, such as wounds, abscesses, cellulitis, superficial/juvenile and deep tissue infections. Clavamox also treats canine periodontal disease and urinary tract infections caused by E. coli. Consult your veterinarian if your pet experiences lack of appetite, drooling, vomiting, or diarrhea while taking Clavamox. Notify your veterinarian of any additional medications or supplements your pet is taking, and also of any reactions to previous medications before giving your pet Clavamox. Follow the exact specifications prescribed by your veterinarian when giving your pet Clavamox. Dogs(All weights): The usual dose for dogs is 6.25mg per pound of pet's body weight given by mouth twice daily. Cats(All weights): The usual dose for cats is 6.25mg given by mouth twice daily.